Trains run hourly to Southease Station from Brighton, Lewes, Newhaven and Seaford.On Monday to Friday there is a bus service calling at Rodmell and Southease from Lewes and Newhaven.It runs roughly hourly during the day.The service is less frequent on Saturdays and there are no buses on Sundays. Café at South Downs Youth Hostel, by Southease station. Open 10-4.Farm shop at point 2 open Tuesday and Saturday.Pub at Rodmell. The instructions start at Southease station or South Downs hostel. From South Downs hostel walk west for about 100 metres/yards to Southease station. Carefully cross at the crossing.There is a small light, which will be green if it is safe to cross.If starting from the station you will also have to cross the crossing if you have arrived from Lewes. From the station a lane starts off heading south and then turns west to cross a bridge over the river Ouse. 1)Once over the bridge you meet the main walk. If you have come from the station turn left here after the bridge.If you are following the main walk turn right here before the bridge. 2)Follow the path down the west side of the Ouse for about a mile (1.5km) until you can go no further.The path turns right to join the Newhaven-Lewes road.Cross this very carefully. It is difficult to see traffic coming from the right. On the other side of the road you will see three tracks.One goes straight ahead to a farm shop.Another goes left at 45 degrees towards to large ornate metal gates.Take this track. Pass to the left of the gates and continue on this track past the houses. 3)Follow the track up the valley for about 500 metres/550 yards.Come to a sign on your left which indicates a bridleway to your left.The legal right of way for our route goes off to the right just before here, at the start of the hedge, but it is much easier to continue up the track.Look for a gap in the hedge further up on the right about 2 metres/yards wide. Turn right here and see a gate ahead of you at the other side of the field.In 2013 the landowner had mowed a path from the gap to the gate to make things easier. Go through the gate and follow the path as it climbs steeply to the left, through bushes. The path turns left at the top of the climb, continues straight for a while and then turns right and then left to meet a lane.This is the north end of Peacehaven. D) Peacehaven was originally developed after the first world war.A first people obtained plots of land and built what they liked (or could afford) on the land, resulting in a higgldy-piggledy development that was so disliked by some that it was a major contributor to the campaign for the introduction of tighter planning laws.The south of the town is now fairly regimented, but at this end of the development you can still get some idea of the rough, ad hoc nature of the development. Continue west along the lane (which finally turns into a track) until the houses come to an end. 4)Shortly after this the lane turns left (There is a bench here). Leave the track and take a path which heads in the same direction that you have been walking up to now.It is slightly to your right. 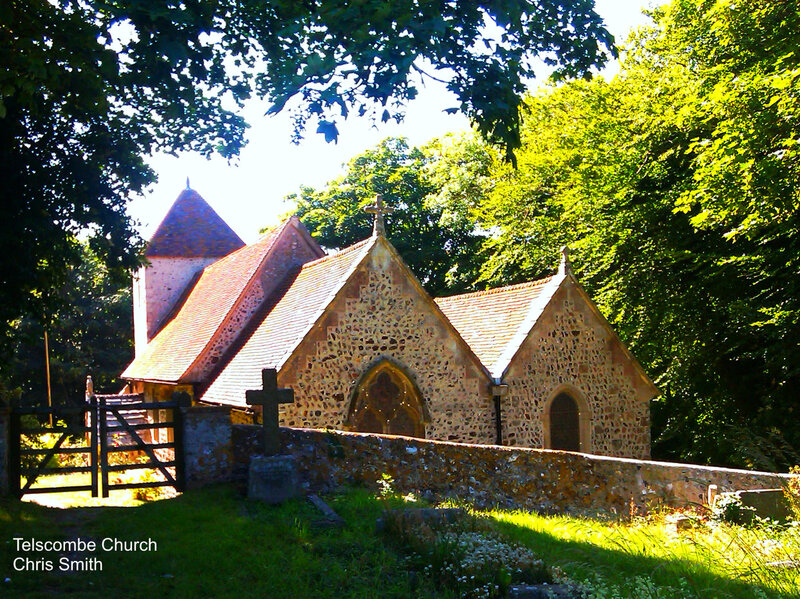 Follow the path until Telscombe church appears.Turn left into the graveyard and walk up to an obelisk.At the obelisk turn right and through a gate. 5) Walk north, downhill on the road into the centre of the village, then straight ahead uphill. 6)At the top of the hill the road turns right.Leave the road here and take a chalk track which descends into the valley.This track turns left and then meets another track. Turn right here and continue walking until you reach a farm yard.Walk through the farm yard, which contains an interesting collection of farm equipment in various states of decay. 7)At the end of the farm buildings you will see a junction with a signpost.You are now on the South Downs Way. If you are in a hurry to catch a train or want to cut down the distance, you can walk straight ahead here.It is a bit of a trudge.Continue down the chalk track until it turns left.Turn right here, following the South Downs Way signs.The path emerges at a cross roads.Cross the main road and follow a lane ahead.Walk down the lane until you re-join the main route at point 11. The main route turns left at point 7 and then right into a field.It then climbs steeply to the top of Mill Hill. 8)At the top of the hill the South Downs Way to Winchester goes north through a tunnel of bushes, but our route turns right down the lane towards Rodmell Village.There are fine views as you descend to reward you for the climb. Towards the end of the lane notice the crescent of council houses on your left with their spacious gardens.Most of these have been sold off as part of the government’s “right to buy” policy.Over a third of all council housing in this area has now been sold off so local people on ordinary incomes have very little chance of remaining in this or similar villages.Elsewhere in the village there is a small development of housing association homes, but they cannot replace what has been lost. At the bottom of the laneyou come to a cross roads.Cross the main road here.The Abergavenny Arms is on your left.Our route continues straight ahead down the main street of Rodmell, past picturesque (and expensive!) houses. 9) The main route turns right by the school, heading towards the church. A)But before you take this you might want to walk a little further down the main street to the Monks House, former home of Virginia and Leonard Woolf.You then return to the school and follow the main route. After the church turn right on a track and follow this back towards the main road. 11) At the end of the path you go through a gate, turn right, go through another gate and then turn left on a lane through Southease Village.Keep going straight ahead to reach point 1. If you are continuing on the walk turn right before you cross a bridge and follow the instructions from point 1 above. 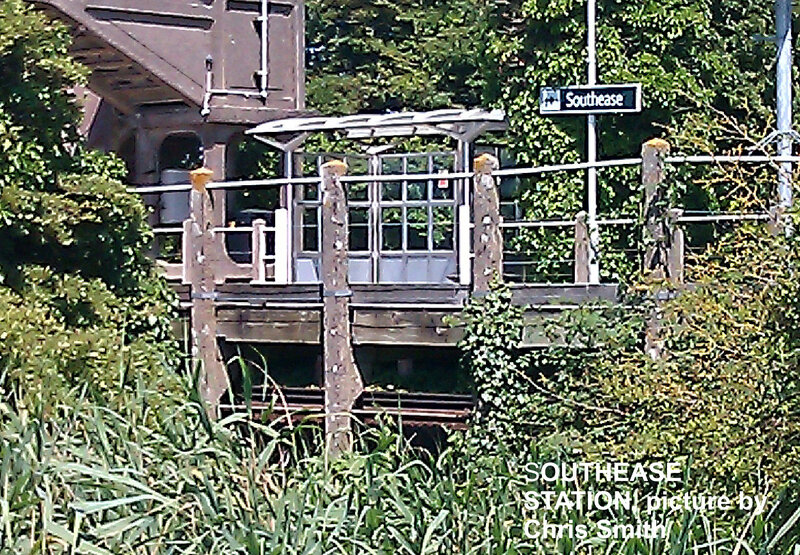 C) If you are going to Southease station continue over the bridge and follow the lane to the left to reach the station. To visit South Downs hostel and café cross the level crossing and continue straight ahead for about 100 metres/yards. There is a small light, at the crossing which will be green if it is safe to cross.This is also the route of the South Downs Way to Eastbourne.